The water-lubricated bearings manufactured by the Duramax Ma- rine Division of The Johnson Rub- ber Company, Middlefield, Ohio, are furnished in sleeve and flanged types with naval brass shell in a full range of sizes. Sleeve bearings are also supplied with a non-metallic shell and are ideal where corrosion or electrolysis is a problem. Flanged bearings are available in solid or split style, and can be furnished for mate mounting with Duramax bronze stuffing boxes that are avail- able in shaft diameters up to 15 inches, and in models for air/water/ grease service, air/grease, air/water, water only, and grease service only. Stuffing boxes employing air ser- vice feature the Duramax rubber "Air Seal" ring, which when inflated seals itself around the propeller shaft and seals out water while packing is being changed. Deflating allows the rubber ring to retract to its normal position from around the shaft. Duramax keel coolers for engine or auxiliary equipment cooling fea- ture spiral tubes of 90/10 cupro- nickel. Single—and double-bank models, which do not require through-the-hull fittings, range from four-tube to 24-tube. KAMEWA for a 98 V2 -foot catamaran ferry in 1980. The high performance of the units was verified by comprehensive full-scale measurements. The tests showed that the water jet propul- sion gave a fuel consumption equal to or lower than that expected for a fixed-pitch propeller installation. The commercially operated passen- ger ferry with the first delivery has accumulated more than 9,000 run- ning hours, during which a high degree of reliability of the 1,560-hp water jet units has been demon- strated. In total, all units in service have accumulated about 100,000 running hours. Thus water jet propulsion, with the then state of the art, could only be justified on some small, special- purpose craft, and the market was not very interesting for KaMeWa. However, it was also realized that if the performance of water jet pro- pulsion could be improved to about the same level as that of a fixed- pitch propeller, water jet units could be a very interesting product. Thus a development program with this aim was started by KaMeWa, main- ly based on the model testing facili- ties already existing within the com- pany. Works, a wholly-owned sub- sidiary of Brent Towing, which documented the K engine's sub- stantial fuel savings advantage over other diesels of similar size. According to tea Brent, "All in all the KTA-2300's have met our ex- pectations and then some. 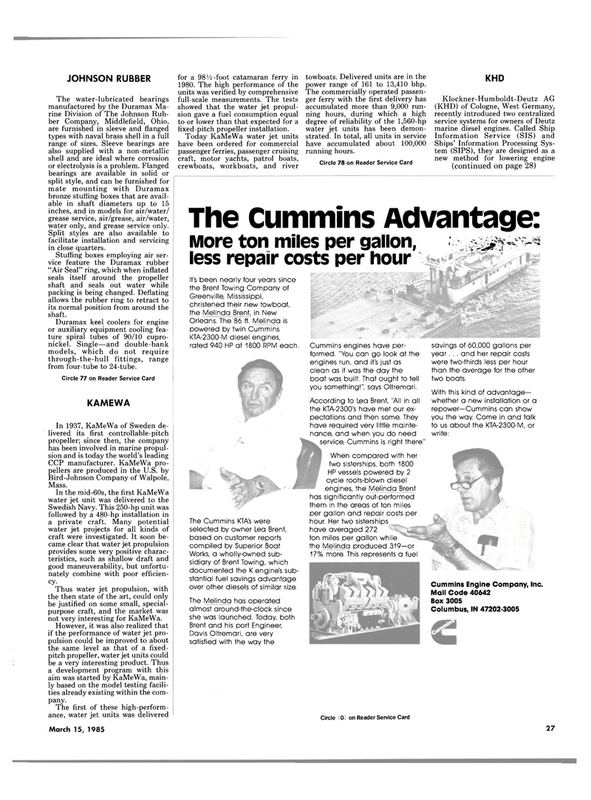 They have required very little mainte- nance, and when you do need service, Cummins is right there." KTA-2300-M diesel engines, rated 940 HP at 1800 RPM each. Cummins engines have per- formed. "You can go look at the engines run, and it's just as clean as it was the day the boat was built. That ought to tell you something! ", says Oltremari. savings of 60,000 gallons per year . . . and her repair costs were two-thirds less per hour than the average for the other two boats.